rec. January, March and April 2014, Auditorio Stelio Molo, RSI Lugano. This recording lays out its cards from the opening Allegro of the Concerto in G major RV 443, which is a whirlwind performance at breakneck speed. Maurice Steger revels in complex ornamentation, virtuoso high-speed articulation and as much contrast as can be mustered from the recorder. Such a no-holds-barred approach has to be admired, though opinions may be divided when it comes to the sublime Largo of this particular concerto. 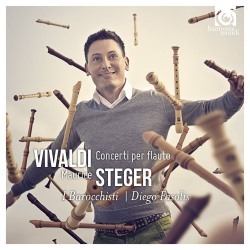 Steger sets in to manipulating Vivaldi’s beautiful tune straightaway, and I for one would tend to hold back just a little more for variation in the repeats. These are elaborated further by Maurice Steger, but once you’ve already commenced with elaborations by the time the music has developed there’s not much of the original melody left. This may or may not bother you and it’s only a minor point as far as I’m concerned. There is so much enjoyment to be had here that personal idiosyncrasies have to be added in as part of the sheer individuality of the whole thing. Moving on to that beautiful Il Sonno movement in RV 439 and you will hear a gorgeous atmosphere, with the upper line played unadorned. Spectacular virtuosity can become tiresome if not supported by superlative musicianship, and Maurice Steger is one of those performers you could imagine acquiring the legendary status of a Paganini were he to have been an exponent in a bygone era. The backing of ensemble I Barocchisti is also superb. This is very much in the early music authentic spectrum in terms of sound, but even if you are less keen on smaller string sections and lack of vibrato you can still enjoy the exciting thrum of archlute, theorbo and salterio. Colours are varied through the introduction of a hurdy-gurdy in RV 95, as well as organ and harpsichord, and extra winds in half of the concertos. This is a cracking selection of concertos, well-chosen and perfectly programmed for maximum fun. The dark beauty of La notte is followed by the rustic joys of La pastorella with its aforementioned hurdy-gurdy, and the musicians picking out plenty of dance-like elements and imagined sounds of nature. RV 566 with its two oboes trips along with tremendous verve, and the bouncy and warm tone of the bassoon should also not be ignored. RV 375 is better known as a violin concerto, but works superbly with its solo lines played on a descant recorder. Maurice Steger varies his instruments throughout this programme, mixing very fine descants and trebles for subtly different colour. The strings fall away for RV 103, and we are left with a delightful chamber ensemble with winds and organ to interact with the recorder in its sighing harmonies. The final concerto is the famous Il gardellino, which invites some fascinating improvisation from the soloist, treating Vivaldi’s notes to birdsong adaptations which are enjoyable and durable. You can sense Maurice Steger’s respect for the music and his uncompromising search in obtaining the best from his instrument. This has its element of daring, but in this case we reap rich rewards. Excellent booklet notes and an essay by Steger on “Vivaldi and his love for the recorder” are the cherry on top of this fantastic cake. Photos of performers amidst showers of instruments or bits of instruments is becoming something of a Harmonia Mundi signature, and presentation here is impeccable. Comparisons of the many excellent recordings around won’t get us far in this instance. Having played this disc even makes fine performances such as those with Michael Schneider on CPO (see review) sound relatively pedestrian. I can imagine listeners used to this more genteel approach perhaps being a bit shocked by Maurice Steiger’s remarkable musical hooliganism, but with superb sound and playing this is a Vivaldi disc which brings ancient music into today’s state of the art, and I have a feeling it will be very hard to beat.